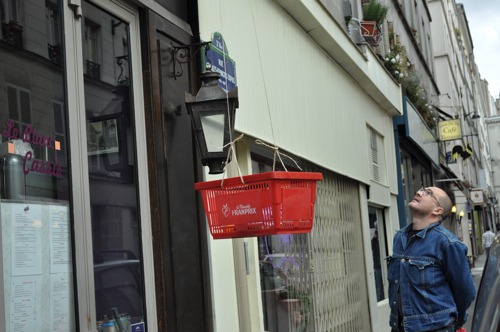 Another man comes by at 12 o’clock, precisely, puts something into his basket and than goes away. He comes back at six in the evening and repeats the same procedure. She had no clue what this is all about. I can tell you what this is all about. It’s art. It’s a piece, an installation, a performance, hell, I don’t know what exactly it is, but it’s something special called “Brooding Parasite Feeding Week”. On Monday 1st November at 12 o’clock a man, a curator we are told, was imprisoned at the Institute of Social Hypocrisy. He stays locked up there for a whole week. He can’t communicate – except with people in the street. Twice a day he’s fed with Norwegian whale meat through the window. His name is Damien Airault and he looks already very thin after a few days of imprisonment. When I walked by yesterday, I felt a bit like at the zoo where people and children gather at 12 o clock precisely in order not to miss the feeding of the seals. And then Victor Boullet appeared. 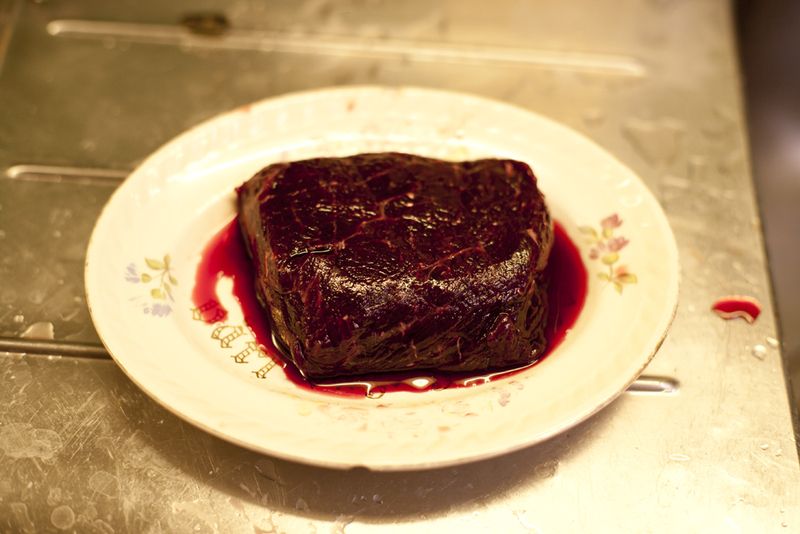 In his hands a covered plate with whale meat, the face frozen like the one of a hunter approaching the prey. He didn’t say a word. He is an artist and he becomes, everyday at twelve and six precisely, part of his work. An experiment testing out human limits? 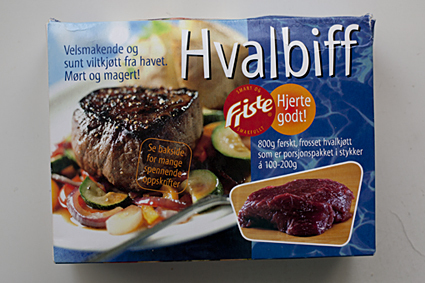 Why does he feed Norwegian whale meat? Is this the Dukan diet that every French woman that gets fat in spite of all sayings follows and which allows only proteins in the attacking phase? An experiment testing out human limits? A political action against whaling? The thing is: it’s art. There is no message, just a brooding action, strangely linked to us. For me it looks as if the preparation of the meal would be the true art part, an act of love: Have a look at the packaging. Doesn’t look very inspiring, right? But here you see what Norwegian artist Boullet makes of it. 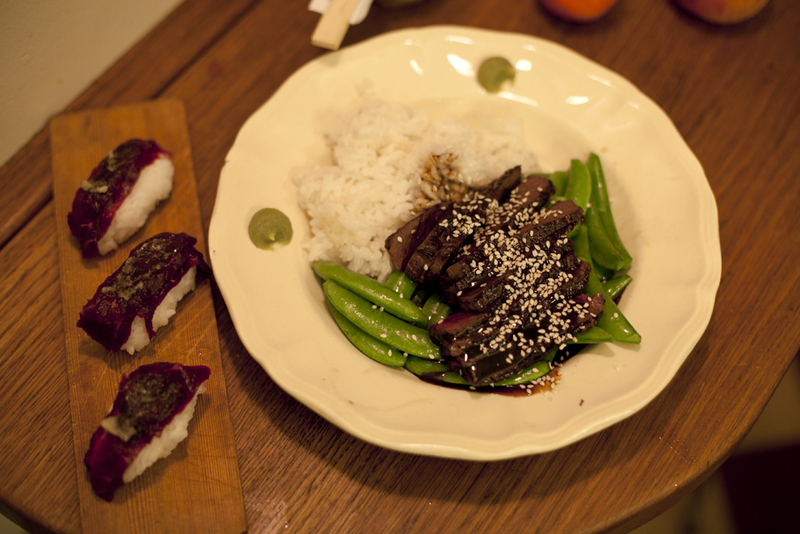 Not so bad at all: Whale meat teriyaki w snowpeas - 3 raw whale meat sushi. Damien's dinner yesterday. Airault is, by the way, equipped with the necessary: 18 litres of water, 6,5 litres of beer, 3,75 litres of red wine, dry frozen coffee, soap, sugar and chocolate bars, Doliprane and even an fire extinguisher. I wonder what kind of books he took with him? I’d like to send him Jonathan Safran Foers bestseller Eating animals. At the end it’s all about the art of becoming a vegetarian.